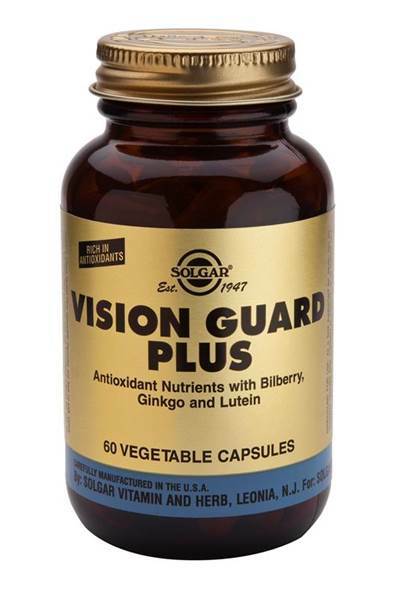 As a food supplement for adults, two(2) Solgar Vision Guard vegetable capsules daily, preferably at mealtime, or as directed by a health care practitioner. Bilberry extracts have been used successfully in many clinical and experimental studies for various eye dysfunctions. The active anthocyanoside (anthocyanidin) flavonoids in bilberry extracts have proven eye tonic properties, and scientific investigation points to potential benefits in preventing or treating poor vision (especially due to age-related degeneration), macular degeneration, cataracts, retinopathy and glaucoma. Studies show bilberry extract improves circulation to the eyes, and enhances oxygen and energy levels in eye tissue. Additionally, anthocyanosidesstabilise collagen (a major factor in maintaining eye integrity) and act as potent antioxidants (free radicals are a major destructive element in eye degeneration). The flavonoid rich extracts in bilberry aid circulation by increasing the integrity of the vascular system, primarily through stabilising vascular collagen, aiding vasodilation, inhibiting excessive platelet aggregation and inhibiting free radical damage. Anthocyanosides bind to collagen and maintain its integrity, thus supporting connective tissue structure in eyes, blood vessels, joints, skin, bone, etc. Anthocyanosides inhibit histamine and inflammatory prostaglandins, leukotrienes and enzymes. They have additional value in that they also prevent collagen fibres from being damaged by enzymes released during inflammation, thereby protecting connective tissue. Myrtillin, an anthocyanoside in bilberries, appears to possess a significant anti-hyperglycaemic effect. Research has shown it to have remarkably long lasting effects, even from a single dose. Anthocyanosides neutralise harmful free radicals due to their powerful antioxidant effect and may support the activity of other antioxidants, especially vitamin C.
Ginkgo exerts a general tonic effect on the vascular system helping improve circulation, to the extremities in particular. Research suggests that ginkgo is effective in cases of peripheralarterial disease where there is arterial obstruction or narrowing, causing a reduction in blood flow during exercise or at rest. The herb's capillary-dilating effect is especially prominent. This herb has been shown to increase cerebral blood flow, and therefore oxygen and glucose utilisation in the brain. As well as improving vascular function in the brain, studies have shown that BE increases the rate at which information is transmitted at the nerve cell level, an ability that is thought to be primarily due to a positive influence on neurotransmitter function. Clinical trials confirm that ginkgo extract improves short term memory, mental alertness and overall cognitive performance. Ginkgo inhibits platelet-activating factor (PAF) - a major chemical trigger in asthma, inflammation and allergies. The flavoglycosides exhibit powerful antioxidant capabilities, a factor which is especially valuable considering the damaging effect of free radicals on brain function. HerbalGram, The Official Newsletter of the American Botanical Council and Research Foundation, Austin, Texas.